Nicole Kidman may look like a woman who has it all: the movie star career, happy marriage, motherhood and a jetsetting glamorous lifestyle. But like all of us, she is not exempt from suffering and grief. And though she has experienced plenty of heartache, it appears the sudden death of her beloved doctor father Antony, who died from a heart attack in 2014 aged 75, has proved the most difficult to recover from. "When my father died, that was a massive shock to me, to my life," Kidman said. "My whole world was suddenly deeply unstable because something was taken so quickly and suddenly. And so I had to work through it and work through it and work through it, because I was so traumatised by the way it happened." Dr Kidman, who was made a Member of the Order of Australia, was a clinical psychologist at the Royal North Shore Hospital and a director of health psychology at the University of Technology Sydney. He died during a trip to Singapore where he was visiting his youngest daughter, Antonia. When a loved one dies suddenly, it often leaves the grief-stricken survivors regretful of words left unsaid. "There were so many things (unsaid). So many things," she says, shaking her head. "I think for anyone that has lost a loved one suddenly, it's a very different journey. Of course all (deaths) are still traumatic, all of them, but the sudden one is something that is very, very hard, because you miss a lot of things that you would have wanted to say. "And that's very frightening to me. When my father died it was not only traumatic for me but for my family. And so I still work through that." She pauses. "But I also feel him. I feel his protection and I feel him there." Now in her fifties, Kidman is cognisant of her own mortality. "As an older mother, I am just incredibly aware of time and the preciousness of it and the desire to be here and be in the world. I am 51 and I have a ten-year-old and a seven-year-old who need mothering. So that's probably where I have a lot of anxiety. "Not one day goes by where I don't go, 'Thank God for my health'. And not just for myself, but so that I can take care of them." 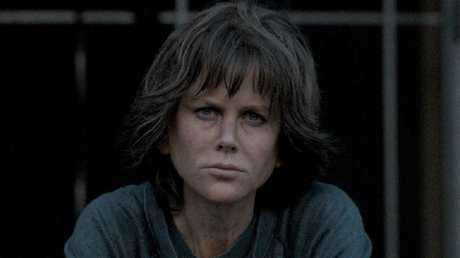 Currently earning rave reviews for her supporting role as a conservative Christian mother in the gay conversion camp drama Boy Erased , Kidman has another two movies due for release soon. In the upcoming crime drama Destroyer, she plays a take-no-prisoners LA police detective and completely immerses herself into this world-weary woman - both physically and psychologically. "My children were particularly shocked with how I looked," she laughs. But being in such a dark state of mind also took a toll on her husband Keith Urban. "He couldn't wait for me to finish shooting Destroyer." Switching genres, she will also appear in the action movie, Aquaman, as Queen Atlanna. What kind of a mermaid would she make in real life? "I teach my daughters to be careful because you don't understand what the weight of that (wave) is. But as an Australian, I consider myself an ocean girl. I have an incredible love of the water and it gives me solace." Nicole as Queen Atlanna in Aquaman. Aquaman is also one of the few Nicole Kidman movies her kids can watch. "Yes. In Aquaman I eat a goldfish," she laughs. "That is the highlight of my career in their eyes." She leans in: "But I have to say it was a gelatine goldfish. I did not eat a real goldfish, as much as I'm dedicated to my art." Getting ready for Christmas, she's packing up the family to head home to Australia. "We go back to Sydney all the time. My mother lives there and as my sister lives in Singapore, my mumma needs us to go back regularly because she has two daughters. "My sister was there just now and Keith and I head out there for the ARIAs this week," she smiles.